16 Port 100 MBPS unmanaged plug and play switch, self-managed no hassle auto detecting switch. Splits one network cable into 15 (1 in 15 out = 16 ports) 10/100/1000 MPBS (auto sensing). Ideal for small businesses where maximum throughput is required and expansion is on hand and ready to go! Supports IEEE 802.3x flow control for Full Duplex mode and bac kpressure for Half Duplex mode. TL-SF1016D 16-port 10/100Mbps Fast Ethernet Switch provides 16 10/100Mbps Auto-Negotiation RJ45 ports. All ports support Auto MDI/MDIX function, eliminating the need for crossover cables or Uplink ports. The Switch is Plug-and-Play and each port can be used as general ports or Uplink ports and can be simply plugged into a server, a hub or a switch, using straight cable or crossover cable. 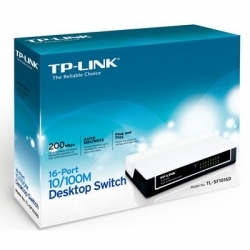 The TP-LINK TL-SF1016D 16-port 10/100M Fast Ethernet Switch provides you with a low-cost, easy-to-use, high-performance, seamless and standard upgrade to improve your old network to a 100Mbps network. It will boost your network performance up to full duplex data transfer. Its wire-speed switching that forwards packets can be as fast as the speed that your network delivers those packets to them.